The old phrase "opposites attract" gets tossed around a lot around Valentines Day, which got me thinking about forces. Electromagnetism is the original inspiration for the term, what with positive charges attracting negative charges, and north poles attracting south poles and the like. I then figured what a good idea for Tuesday! Believe it or not, we're all walking on the surface of a gigantic magnet. 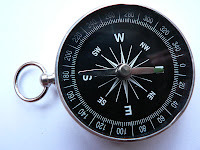 Compasses work because planet Earth itself is encased by its own magnetic field. A magnetic field is created by a moving electrical charge. Electrons buzzing around an atom's nucleus each create a very small magnetic field, which is usually canceled out by a nearby atom. However in certain metals like iron and nickel, huge numbers of these electrons can line up and create a large scale magnetic field. That's how a typical compass needle is magnetized, but how about planet Earth itself? The wild thing is scientists are not entirely certain what exactly causes it. The prevailing theory is that the iron core of the Earth is under so much pressure it crystallizes into a solid form. The super hot liquid iron moving and churning all around it creates a gigantic, but relativly weak, magnetic field. This field sticks up out of the Earth's poles and attracts the ends of magnets, but only lightweight ones that are perfectly balanced rotate to point North. Here’s a question: If the old axiom "opposites attract" is true (which it is when talking about magnets) why is my "North" side of the compass point to the "North Pole." The reason is simple, the "North Pole" of Earth, is actually the south pole of its magnet. Map makers fudged the name so making sense of directions and compass readings would be easier. Also the spot where the compass points on Earth is not actually the axis where the Earth rotates. Earth's "Magnetic North," where its field lines emerge and compasses point, lies off the coast of Ellesmere Island in northern Canada. The magnetic pole is always changing intensity and location sometimes even switching direction. Archeologists have been able to track these changes. Tiny magnetic signatures in rocks with iron deposits can tell where and how strong the Earth's magnetic signature was at the time. Using this information, scientists have been able to date ancient human fossils, and even track the drifting continents over millions of years. thanks! this has been very helpful for my understanding of compasses. I can now continue my assignment!